Dix Steele doesn’t have a job, or want one. His wealthy uncle mails him a monthly check so that Dix can concentrate on writing his novel. It should be noted that Dix is not writing a novel, nor is he grateful for his uncle’s support. After all, the old skinflint could easily afford to send more! Yeah, Dix has his little quirks, like the fact that he’s weirdly sensitive to loud noises; the buzzing of his electric razor is almost more than he can stand. Another little quirk: he stalks young, unaccompanied women and strangles them. His latest victim was named Mildred Atkinson, but she wasn’t the first, nor will she be the last—even cute little dogs aren’t safe! On a whim, Dix decides to look up his wartime buddy Brub Nicolai, whom he always regarded as a sort of “big brother.” As it turns out, Brub and his wife Sylvia live nearby, and they invite him over. Brub and Dix catch up on old times. Dix tells Brub he’s writing a novel. Brub tells Dix how, after the war, he joined the LAPD, and has worked his way up to detective. Currently, he’s on the homicide squad, investigating the recent string of strangulation murders. Amused by the irony, Dix begins spending a great deal of time with Brub, even visiting him at the police station—hiding from the cops in their very midst! Meanwhile, there’s an attractive redhead living in Dix’s apartment complex. She intrigues him, but before he can do anything about it, she shows up at his door, announcing she expects Dix to drop everything and take her out to dinner. Recognizing that Laurel Gray is a unique woman, Dix decides, what the heck, he won’t strangle her. Before long, he falls for her in a big way. Laurel detests wealthy people, but plans to become one of them by snagging a rich husband. Despite her feelings for Dix, only a sap marries for love! Soon she’s spending less and less time at the apartment complex, until one night she doesn’t come home at all—or the next day, or the day after that. Dix’s smug arrogance begins to crack, then crumble: Has he lost Laurel forever? Is that car following him? Have the police figured out that he’s the strangler? Is everything about to end very badly? No… no (he assures himself), he’s Dix Steele! He’s far too clever to ever be caught. Told from the point of view of a woman-hating serial killer, Dorothy B. Hughes managed to make In a Lonely Place a surprisingly feminist work. Laurel Gray, though a deeply flawed human being, is strong enough to avoid becoming Dix’s victim. And ultimately, Dix is brought down by one of the female characters—which is about as much as I can say without spoiling the ending! Now meet a very different Dix Steele (played by Humphrey Bogart). Dix was once a successful Hollywood screenwriter, but has fallen out of favor because of his explosive temper—he tends to punch directors in the face. But Dix’s agent Mel has good news: he’s persuaded the studio to give Dix another chance; all he has to do is adapt a romantic bestseller into screenplay form. “Just follow the book,” Mel advises him. Dix, however, takes great pride in his talent, and has nothing but contempt for hacks that aim for the lowest denominator—“popcorn salesmen,” he calls them. Still, he needs the money, so Dix begrudgingly takes the job. To adapt the book, Dix first needs to read it. But he’s so convinced that it’ll be garbage, that he can’t bring himself to even open it. A solution presents itself: he overhears a ditzy hatcheck girl named Mildred raving about how much she loved the book. 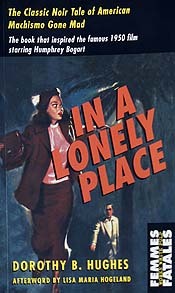 Dix invites her back to his Beverly Hills apartment to summarize the plot to him, saving him the agony of having to read it himself. Mildred gushingly retells the novel (using an impressive variety of malapropisms in the process). Yep, it’s garbage, all right. Depressed and exhausted, Dix slips Mildred a few bucks, and sends her on her way. Within hours, the lifeless body of one Mildred Atkinson is discovered nearby. Dix’s friend, LAPD detective Brub Nicolai shows up at Dix’s apartment, and finds him apparently just waking up, after having slept in his clothes. Brub is suspicious, but has always looked up to Dix, who had been his commanding officer during the war. Needless to say, they immediately fall in love, becoming inseparable. With Laurel as his muse, Dix begins work on his screenplay, but rather than “just following the book,” he throws himself into it with a vengeance. As Dix and Brub’s friendship becomes ever more strained by the ongoing investigation, Laurel gets her first taste of Dix’s violent streak. Following a minor traffic accident, only Laurel’s intervention prevents Dix from beating the other driver to death. Later, Laurel tells Brub’s wife Sylvia of her concerns, expecting Sylvia to tell her she’s just being silly. She doesn’t. The screenplay completed, Dix wants to settle down with Laurel, but she’s beginning to have second thoughts. Is Dix guilty of murder? Even if he isn’t, how can she marry a ticking time bomb? On the other hand, how violently will Dix react if she tries to break off their relationship? I won’t reveal how it all resolves itself, but, as they say, don’t expect a happy ending. It’s something of an in-gag that Mel keeps telling Dix to “just follow the book,” because that’s precisely what screenwriters Andrew Solt and Edmund H. North didn’t do; except for the character names, the movie has little to do with Hughes’ novel, which, as you may recall, was not a bitter indictment of the Hollywood studio system! 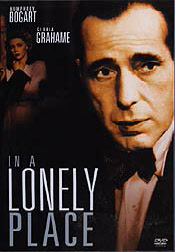 That being said, fans of film noir usually rate In a Lonely Place as one of the best. Everything about it, from the dialogue to the cinematography is superior, and come on! It’s got Humphrey Bogart! How can you beat that? I’D RATE IT: 4½ out of 5. Just follow the book. Unless not following the book makes a better movie!